Jaguar has hinted that it could offer multiple battery options of its first electric car, the I-Pace SUV, providing lower-cost versions which could broaden its appeal with fleets. The I-Pace goes on sale from March 2018, will at first be built with the single option of a 90kWh battery providing “more than 500km” range (300 miles). Launch models could be followed by versions with reduced power and a smaller battery capacity, using the modular design of the battery pack to provide different kilowatt-hour capacities in a less expensive package. However, this will likely depend on demand. 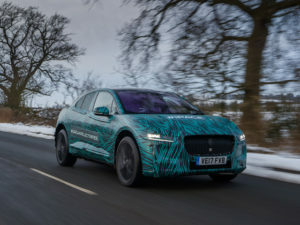 Speaking to Jaguar’s vehicle integration manager for I-Pace, James Matthews, on-site at Jaguar’s Gaydon HQ, Fleet World was told numerous details about the vehicle including chief specifications: dual electric motors producing a combined 394bhp, 516lb/ft torque, coupled with a 90kWh (84.7kWh usable) Li-ion battery and a single speed transmission. Performance figures remain unannounced, but Jaguar says they aimed for, “frighteningly quick”. The SUV is also some 400 kilograms lighter than a Tesla Model X. After 200 prototypes and 1.5 million miles of drive testing and 11,000 hours of rig tests, the I-Pace is almost ready for serial production by Magna Steyr in Graz, Austria, where the car will be built on the same production line as E-Pace. This is significant, as I-Pace must therefore be built at the same speed as a more conventionally powered car. Jaguar does not foresee a supply issue from battery maker LG Chem, despite other marques in the automotive industry having had supply issues, namely Hyundai for its Ioniq Electric. Two different regen modes are available and single pedal operation is possible, reducing brake pad wear, service and maintenance. The I-Pace also features a special Jaguar ‘growl’ noise that is emitted externally via a pair of speakers fore and aft to alert pedestrians to the car’s presence at speeds of up to 18mph. Pricing will be announced in the new year.